In 1911–1944, the building on Herkaus Manto Street 27 (former Libauer Str. 5) was the home of Adomas Brakas (1886–1952) — the artist, architect and teacher of Lithuania Minor. The house, built in the second half of the 19th c. was reconstructed and became the Capitol Cinema in 1930. During the soviet era it housed the Švytūrys Cinema. 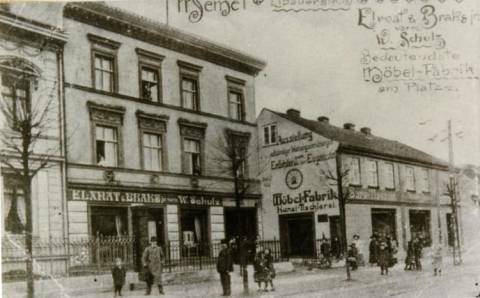 The family of Adomas Brakas also owned a nearby building, also marked with the number 5, which was used by Adomas Brakas furniture factory. That building did not survive to this day. Adomas Brakas was an artist, publicist, teacher and cultural figure of Lithuania Minor. He studied at Tilsit Gymnasium, as well as Paris Academy of Art, and settled in Klaipėda as of 1914. His views were largely influenced by the ideas of the philosopher Vydūnas. During the World War I he was mobilised and served as a paramedic. When Klaipėda region was controlled by France (1920–1923), Adomas Brakas was the chairman of the union of Prussian Lithuanians in Prussia. In 1922 he participated at the conference of ambassadors in Paris. During the events of January 1923, in Klaipėda he organised the Rescue Committee. He was also the leader of Santara union of youth organisations and a co-founder of Aida singers' society. Adomas Brakas was one of the founders of Aukuras culture and education society, which operated in Klaipėda in 1922–1939, taking care of the issues, related to Klaipėda conservatory, opera and symphonic orchestra. In 1920–1939 he worked as a drawing teacher at Klaipėda Vytautas Magnus Gymnasium. As an artist, Adomas Brakas produced a number of painting and graphic works, as well as illustrations for books and magazines. He is regarded as one of the first 20th c. illustrators of Lithuanian press. He designed the buildings of the Bank of Lithuania and Kristijonas Donelaitis Progymnasium in Pagėgiai, his ideas were used for the construction of Vytautas Magnus Gymnasium too. The monument For the Freedom Fighters of 1923, built in the city cemetery in 1925 was also made according to his project. After the annexation of Klaipėda region in 1939 he was imprisoned by the nazis. In 1941 Adomas Brakas and his son Dovydas were arrested by the soviet NKVD and imprisoned at Bijsk concentration camp. There, he lost his eyesight, health and eventually died in 1952. The home of Adomas Brakas in Klaipėda had become a place for Lithuanian gatherings and culture. It used to host youth gatherings, Aida singers' society, as well as Aukuras culture and education society. There were also occasional visits by Vydūnas, who used to come from Tilsit and lead the choir himself. In 1921–1938 the house was frequently visited by the writer Ieva Simonaitytė, who used to read her poems during various gatherings. The building survived to this day with Prezo bakery currently working on the first floor (2017).